These are wonderful cookies, extremely crispy on the first day; they become softer with time; both ways they taste absolutely delicious!!! The name of the cookies Anzac stands for Australia and New Zealand Army Corps. Their origin is not clear, however, it is said that these long-keeping cookies were baked by Australian/New Zealand women during the WW I for the soldiers fighting overseas. I made the cookies for Taste & Create food blog event hosted by Nicole from For the Love Of Food blog. The rules of the event are simple- Nicole pairs you with another food blogger and then you have to cook something using a recipe from your partner's blog. This month I’ve been paired with Allen from Eating Out Loud blog. 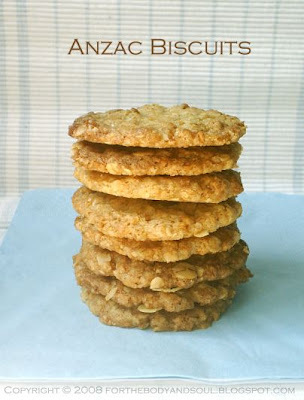 Allen has lots of wonderful recipes on his blog from which I’ve chosen Anzac biscuits. I’d come across the recipe for these cookies on a few other food blogs before and really wanted to try them, and since there’s Anzac Day in Australian and New Zealand on 25th April, it was a perfect timing. I baked the cookies twice. First time I followed the recipe from Allen's blog almost exactly (the only change I made was replacing golden syrup with maple syrup as the first one is quite hard to find in Poland). Even though the cookies came out tasty, they had some soda aftertaste that I didn’t like. So, I baked the cookies once again adapting the recipe slightly. I reduced the amount of baking soda in the recipe, I used cane sugar in place of white sugar and added a little bit of sea salt. The cookies came out perfect, very crispy at the edges and a little chewy inside without the soda aftertaste. The addition of sea salt makes these cookies very similar to my favorite Polish oat cookies Złotoksłose sold in grocery stores here. Delicious!!! Here’s my adapted version of the recipe, Allen's recipe can be found on his blog here. I used Demerara sugar in this recipe, but regular sugar or brown sugar will work well too. If like meyou have trouble finding golden syrup, maple syrup or honey will make a nice substitution. Enjoy!!! 1. Preheat the oven to 160 C (320 F). Line a cookie sheet with parchment paper. 2. In a large bowl, mix the flour, oats, coconut, and sea salt. 3. Combine the baking soda and boiling water in a small bowl to dissolve. 4. In a small pan over low heat combine the butter and golden (or maple) syrup or honey. 5. Remove from the heat and stir in baking soda and water mixture. 6. Pour into the bowl containing the dry ingredients and stir. 7. Roll into small bowls, place on parchment generously space apart. 8. Press down with the back of a spoon to flatten. 9. Bake for 8-12 minutes or until the cookies are deep golden brown on top. The cookies look absolutely wonderful -- great job! Anything with coconut and I am THERE!